An electrical contractor providing complete peace of mind. If you are looking for an electrical contractor to help with any electrical connections or installations project around the home or workplace, then we are the team you should get. 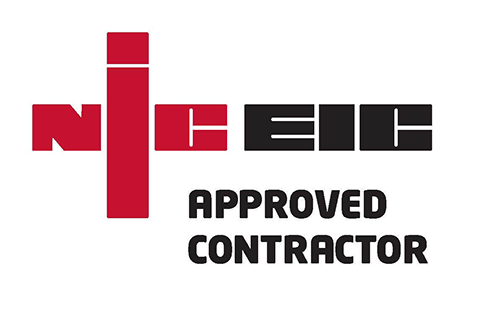 Not only are we the best at what we do but we are NICEIC approved. NICEIC is the UK’s leading voluntary regulatory body for the electrical contracting industry and we are part of it. As an NICEIC Approved Contractors this means that we take our work seriously. Unlike lots of other contractors out there, we make sure that the price we quote to our clients is a fixed price for initial attendance, there are no hidden costs. This means that you can be sure that your project will be completed by a qualified domestic electrician and with a price that isn’t going to shock you. We are a team of 10 qualified, experienced and dedicated electricians and if we say we are coming to your job then we guarantee we are coming. We have all the latest up to date and necessary equipment for any type of electrical job and that’s not all, on top of the NICEIC independent guarantee you get, we also provide you with our own 12 month guarantee because we have confidence in whatever we do. If our client is not happy with the work we have done, he/she has the freedom to go to NICEIC, however, since we have a reputation to protect and a goal to achieve, we always make sure our customers are never disappointed. What makes us one of the best NICEIC Approved Contractors in the area is the fact that our services are bespoke. This means that you can give us your idea and we put it to work. There is nothing that pleases us more than providing our clients with a service that exceeds their expectations and at a price they expect. Call us on 01282 454722 today to discuss how we can be of service to you. Why choose Avon Electrical Ltd? If we say we are coming, we are coming! Office: 9 Farrington Court, Farrington Rd Industrial Estate, Burnley, Lancashire BB11 5SS.